The Heller case ostensibly revolved around firearm ownership, but what it was really about was the Second Amendment, which doesn’t explicitly say “firearms,” rather only “arms.” The term “arms” when the Bill of Rights was written certainly included knives. So, there’s no doubt that this decision impacts our rights as knife owners, just as it does gun owners. So, what does the Heller Decision mean to knife owners? To cut to the chase, in the short term it means only that the fight for our Knife Rights will continue unabated. The decision explicitly allowed for restrictions on ownership, carriage and use of the arms that the Court decided was your individual right to own. What it didn’t do was define the limitations on those restrictions and what circumstances would allow the government to restrict those rights. The Court left that to another day, which is why your vote this November could have far reaching consequences. The potential good news is that it appears that the decision requires that strict judicial scrutiny be provided for any restrictions on this right. This is the same high level of protection accorded to such cherished and well protected rights as the First Amendment’s protection for speech and the press. Unfortunately, the Anti’s are not about to give up and they will continue to encourage, propose and enact restrictions until such time as case law can be developed that more specifically defines the limits, and that will take a long time and a lot of money and some courageous defendants and attorneys, as is always the case. The fight for protecting our freedoms does grind slowly. Following up on the success of our first booth at the NRA Annual Meeting in Louisville (see report here), we ventured down to Atlanta for Blade Show. This year we got a booth inside the exhibit hall, which worked out very well. Well known retired knifemaker and current sheathmaker and knife law expert witness Ron (R.W.) Clark joined us in the booth. We had a lot of folks stop by and many joined at the show. 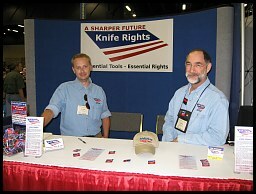 We made progress on our efforts to launch the legal section of the Knife Rights site. Hopefully, this will bear fruit in the next few months. We also put together some very sweet deals for Knife Rights members and for fund raising efforts that we’ll be announcing over the next few months as we sort out final details. I am very pleased to announce the first of the special deals that was done at Blade Show. Knife Rights member and renowned knife photographer, Terrill Hoffman, has offered up a deal that should be hard to refuse. We’d also like to acknowledge the generous contribution of a new Corporate Member, Rowen Manufacturing.